Call to Action: Masks and Capes! Hey everyone, it's time for our next Call to Action! For this one, I'm going to defer to @Maressa, one of our own loyal community members in Ireland who proposed it to me. (So she knows a thing or two about having good luck!) When she told me this idea, I immediately thought that it's brilliant, that it's an awesome way to show NCsoft that we are heroes, that this is what we do. So with my full backing and support, I'm going to let her give the details of our next Call to Action! Re: Call to Action: Masks and Capes! Hi folks, first off I want to thank TonyV for all the hard work he has put into this campaign so far. And of course a huge thank you to all of you in the community. Tony and I couldn’t do this without your support. Now, I know there have been calls for people to send cakes, and dolls and all sorts of things. Well that’s what this is. Except, cakes aren’t really all that relevant to City of Heroes, and dolls…well they can be a bit expensive. So, we have come up with a cheap way to get the attention of NCSoft. By sending them in Capes and Masks. Thankfully Halloween is coming up so there are a lot of online stores out there selling Capes and Masks. I have picked a Cape and Mask that are cheap and plain enough that they aren’t clearly one character or another. Now, by no means do you have to use these two. These are just what I found in a few minutes of searching. You may even find something at your local dollar/euro/pound store. 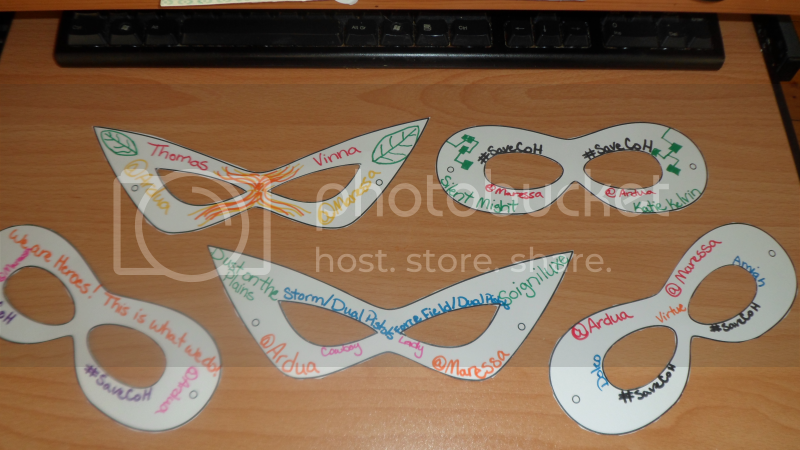 Another option, one I plan to be doing is printing out our own masks to be decorated. I’ve found a couple and thanks to my team had them laid out for you so you can print several out without wasting paper. Even if you aren’t artistic you can get involved. Write messages on them, but keep it polite and clean. We are Villains. What’s ours is ours. What you put on them is up to you. 6801 N Capital of Texas Hwy. And, if you’d like to send in a picture of your masks to Tony and I, we would love to see them. 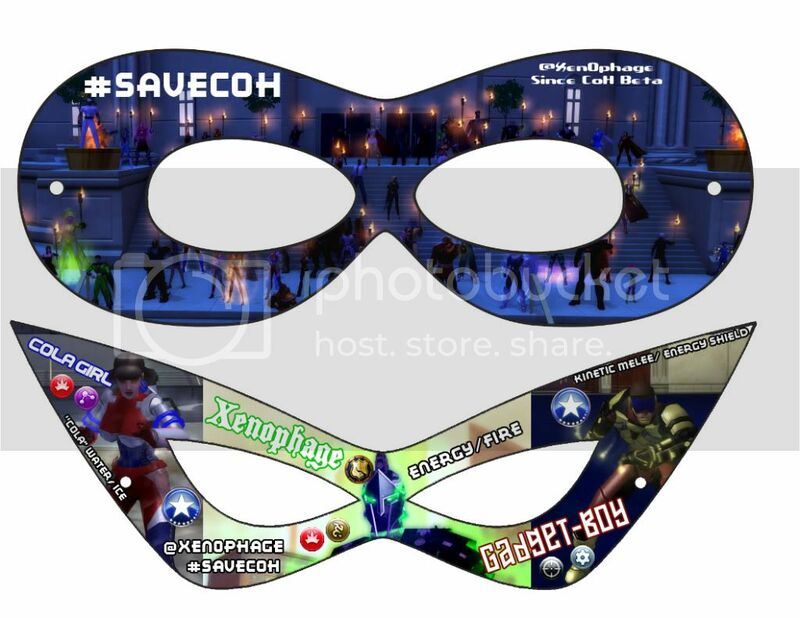 Send the pictures to masks@cohtitan.com and we will include them as part of our press package. Thank you all for your huge support. Start sending out those Masks & Capes! I'm tempted to make a mask with Arachnos pattern because I play a Widow in my account... Will get this worked out when study break comes by. Awesome idea though. Thank you! Great idea! I'll be adding that to my to-do list. Brilliant as usual. I'll be picking up some supplies for this tomorrow. Awesome idea. I'll be working on this this week. If someone can acquire one for me, I will GLADLY don it in support of this idea! SOOO loving the idea. I will be sending each mask I get separately. With me in Arkansas I will likely target the Dallas office for a semi-local effect. I'm still putting my shirt idea together. Once I have it I will be sharing with everyone. I have taken out the sewing machine, and am working on replicating my main toons cape to send in. Paper is interesting, but an actual cloth cape should stand out. What about any folks who maybe have pics or parts from Paragon's Halloween contest a few years ago? I didn't participate, but I know they ran a "dress up like your toon" contest. Anyone else remember this? It would be awesome to send in pics of your toon and you side by side. I'll be doing mine as well and I can get my kiddo involved too for her toons! Spreading the word about it and preparing the shipment ! With Halloween coming, this should be a piece of cake. There are even masks (and sometimes capes) in the grocery store. I have to head to Walmart later today, and I'll be sure to pick something up there.